Why did I buy a camera? My father was an ardent amateur photographer, and never failed to get on our nerves at every occasion, calling us to stand still while he took a shot, be it before the Great Wall of China or the Moscow Kremlin, or in the house garden or before the Christmas tree. Later, of course, we greatly enjoyed looking at ourselves in the photo album. But at the moment the photos were taken, we were typically making it rather difficult for him. Thats probably the reason why I was never eager to make photos, let alone to own a camera. Not that I never had one, really. When I was a student, I got a camera as present from my father, and I actually used it the one time or other. In later times too, it would happen that I made a snapshot or another at some occasion, though not with my own camera, because mine had long since become non-functional. Why then did I suddenly buy a camera in summer 2005? 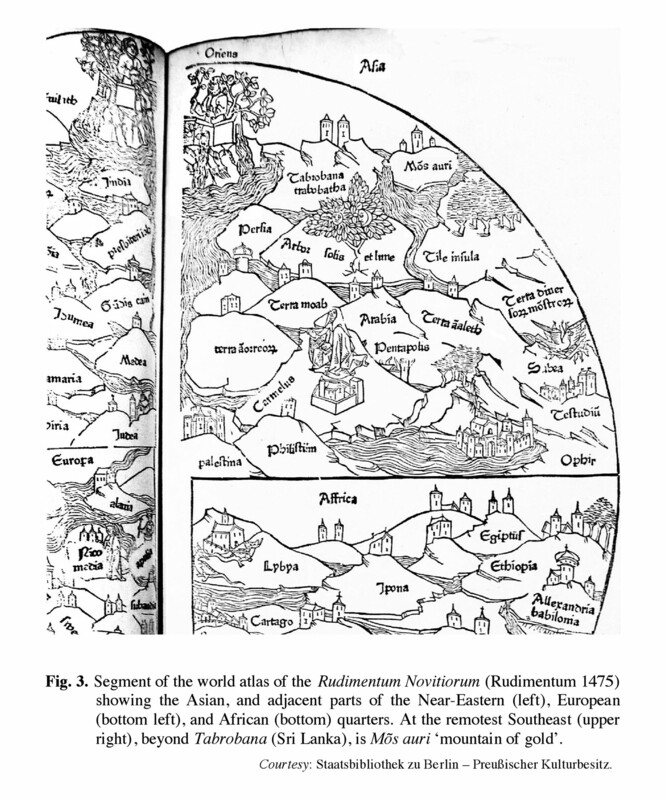 Well, I was busy writing my 2007 monograph on Malay words and Malay things in German publications before 1700, and I planned to include some illustrations. I was getting along fine, as I either could order or download scans of the pictures I wanted, or even make copies on a copying machine of post-1880 reproductions of originals. 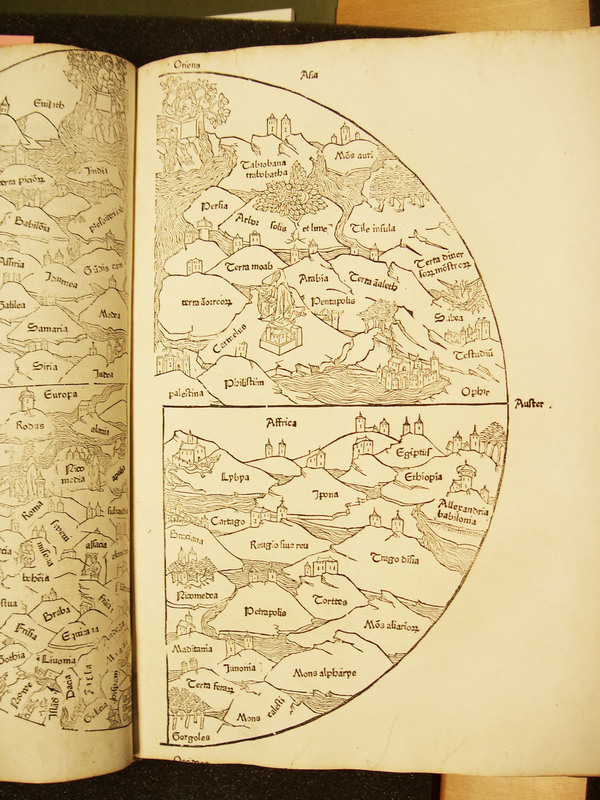 Until I decided I also wanted a copy of an atlas segment from a 1475 publication, a so-called incunabula, having appeared in the cradle-period of printing. There were reproductions available, but when I discovered that the State Library here in Berlin had an original, I realized that I just couldn't settle for less. Time was running short. And, besides that an ordered image required a long time to be delivered, it would also be rather expensive. That was when the librarian lady told me en passant that one was allowed, however, to photograph it free of charge, if one did it oneself with an own camera without flash. That settled it: I bought a (digital) camera. I loosened some empty pages from my notebook to cover the chair seat and a patch on the table. Stepping on these I climbed onto the table, and bent forwards to make a snapshot straight from above the original (left). The final results are on p. 13 of Mahdi (2007) (above right). Hardly three weeks later, I got a second opportunity to use my new camera. 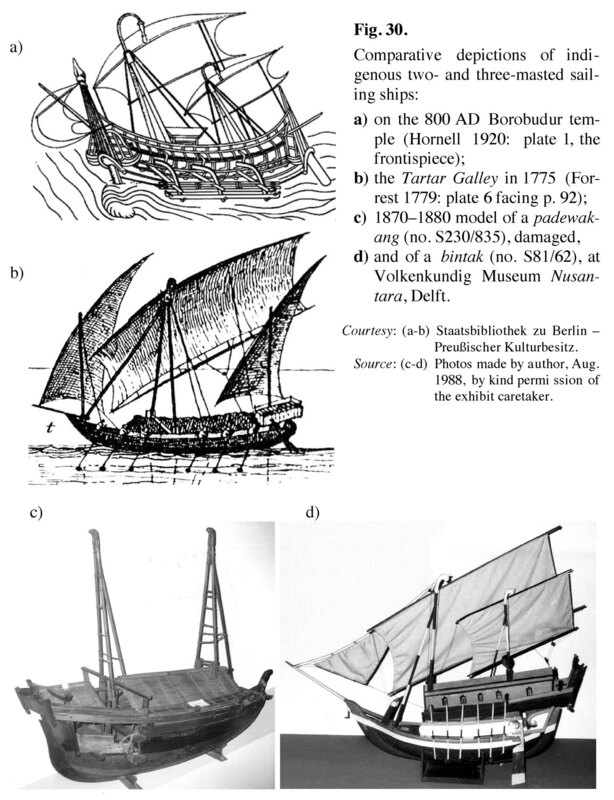 I needed some comparative illustrations of indigenous watercraft from different historical periods, and the engraving of the Tartar Galley in Forrest (1779, pl. 6) fitted just fine with other images I had. This time I could place the opened book on the table almost vertically, facing the window, so I did not need to climb on the table. I simply stepped back and snapped a shot from the side, keeping both feet on the floor (above). The image became Fig. 30b on p. 224 of Mahdi (2007) (right). With that, I had saved far more in reproduction fees, than the price of the (very cheap) camera. [Anonymous], 1475, Rudimentum Novitiorum. Lübeck: Lucas Brandis. 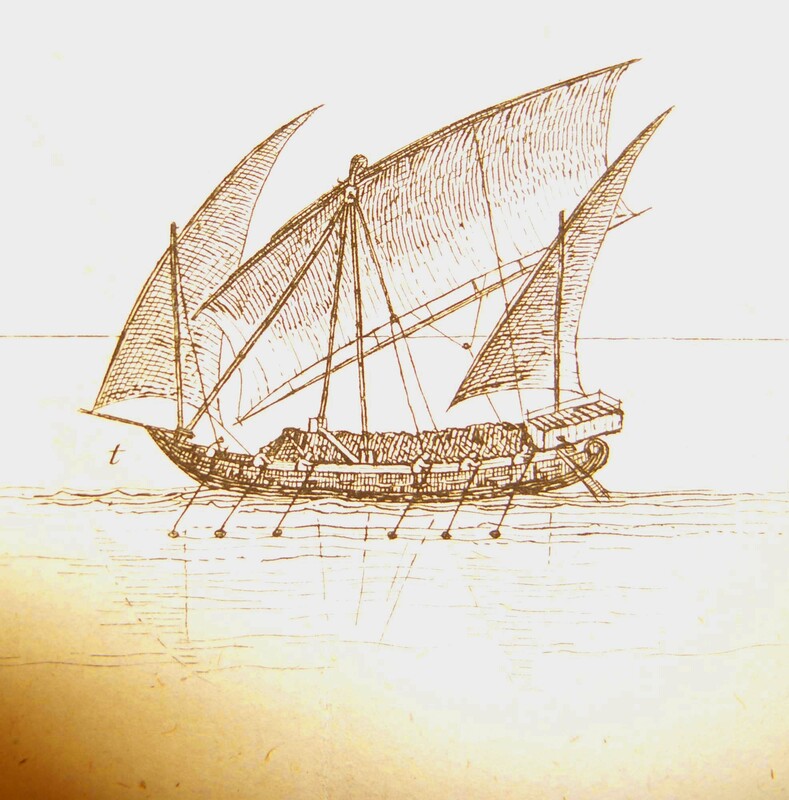 Forrest, Thomas, 1779, A Voyage to New Guinea, and the Moluccas, from Balambangan, [...] Performed in the Tartar Galley, belonging to The Honourable East India Company, During the Years 1774, 1775, and 1776 [...]. London: G. Scott.